I don’t remember for sure if it was my dad or maybe my uncle who first pointed out a $100 nail. I can say it was some time ago because that $100 nail would be worth several hundred now. I also don’t remember where I was the first time I found a $100 nail or how many more I have found thru the years. Every now and then you might find one worth thousands and one could argue that some of them may be priceless. We were likely somewhere on the farm, probably near one of the barns when they asked me would I mind picking up that 100 dollar bill by my left foot. I looked down and didn’t see any sign of a 100 dollar bill, but there lay this old rusty nail so I reached down, picked it up and at the same time asked where the money was. Then it was explained to me that had the old rusty nail not been picked up, it very well could have ended up in a tractor tire, might ruin the tire which could cost $100 or more to replace. Since a penny saved is a penny earned, the nail in hand was easily worth a hundred dollars. Today that $100 nail would be worth several hundred. A nail found that prevents a blowout out on the highway could be worth thousands and a nail found, for instance, in a school bus yard could be priceless. Images depict moisture damaged section of smooth-surfaced EPDM roof. Infrared inspections of low slope insulated roof systems, and many other applications, are a lot like looking for $100 nails. You have to gauge your success and the worth of the inspection by what you have prevented and not so much by what you have found. A roof inspection that finds five small wet areas on a 2 year old 100,000 square foot roof may have saved replacing that roof several years before it was planned making that $5,000 inspection worth several hundred thousand dollars. 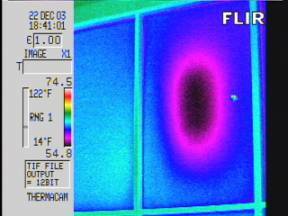 Infrared inspections provide value by preventing unplanned repairs and replacements. The best value and the most savings is realized when the inspection finds the minor problems that are easy and inexpensive to repair. Just like picking up old rusty nails. 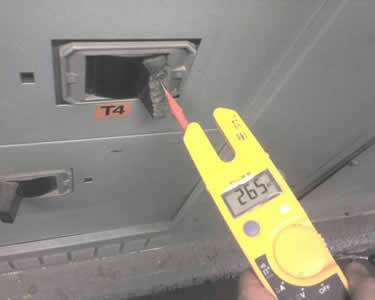 Thermographically inspect capacitor bodies. Energized capacitors should be warmer than ambient air temperature and exhibit equal temperatures across all phases. Locating pipe leaks hidden within finished walls can be tricky. In this Tip we examine the use of thermal imaging and airborne ultrasound to help pinpoint the source of a leak. Ever had one of those pesky water plumbing leaks in your house, but loathed the idea of tearing out ever-larger sections of ceiling, walls, and floors to find the source? An IR inspection can often ‘see’ thermal profiles created by wet building materials, but an airborne ultrasonic detector can be useful to ‘hear’ and help pinpoint the leak source. Recently, we found water soaked ceilings and walls in our mid-level bathroom and adjoining laundry room, and water dripping into the basement below. We suspected a leak in the household plumbing system. Most dripping ceased within a few hours of shutting off the city water supply. So where does one start with tearing out ceilings, walls, and floors to find a water leak? As an alternative to gross demolition, I drained the household water system, and pressurized it with a small air compressor to about 50 psi. With a UE Systems Ultraprobe 9000 in ‘airborne’ mode, I started scanning and ‘listening’ for air leakage signals from the wet ceilings and walls in the laundry room and bathroom. Within a minute, a faint (very high frequency) leaking indication was detected from a ceiling area directly above the bathroom sink. I cut out a 10” area of sheetrock to allow better access to the noise source and found the noise emanating from a soldered joint of half-inch copper tubing. Even with this leak exposed, the ‘noise’ could not be detected by the unaided human ear. Yet the Ultraprobe had originally ‘heard’ the leak noise even with the sheetrock in place. In this case the leak source was quickly located, potentially saving thousands in home repair bills. As is the case with thermal imaging, training and experience are essential to become proficient in the effective use of ultrasonic sound detectors. Uninterruptible Power Supply (UPS) systems are commonly found in facilities where reliable electrical power is critical. Infrared inspections can play a key role in maintaining these crucial systems. An Uninterruptible Power Supply (UPS) system is an electrical apparatus that provides short-term emergency power to a load when the normal input power source fails. Unlike standby generators, UPS systems provide instantaneous protection from input power interruptions by means of attached batteries. UPS systems are typically used to protect computers, data centers, telecommunication equipment or other electrical equipment where an unexpected power disruption could cause injuries, fatalities, serious business disruption, or data loss. Due to their critical role, it is imperative that UPS systems be maintained to ensure reliability when needed. Performed under the correct conditions, thermal imaging can be useful in detecting defects within a UPS system including loose or deteriorated connections, overloads, and faulty components. When combined with regular preventive maintenance, thermal imaging can detect faults that are undetectable by other means. Thermal imaging may be applied during normal operation of the UPS system or during a controlled discharge test. If imaging during the latter, a thermographer will have to work quickly to ensure complete coverage of the subject components. Infrared inspection of power distribution systems is one of the many topics covered in the Level I Infraspection Institute Certified Infrared Thermographer® training course. For information on thermographer training or to obtain a copy of the Standard for Infrared Inspection of Electrical Systems & Rotating Equipment, visit the Infraspection website or call us at 609-239-4788. Like all fine optics, the lens of an infrared camera must be treated with special care to maintain the integrity of the image and accuracy of the information you are expecting it capture. As with most lenses, an infrared camera lens has a spectrally selective coating on its front surface that is specifically designed to be the transmissive in the frequencies of infrared energy. Damage to the coating on the lens surface can change the bandpass and rejection of the selective coating modifying the amount of infrared energy transmitted through the lens and onto the detector chip, thereby changing the amount of infrared energy the camera sees and therefore the cameras calibration. In fact, a large degradation in a specific area such as a deep scratch on the surface of the lens could require a re-recalibration of the camera because the pixels behind that area will receive a different amount of infrared energy than the other pixels on the chip where the lens is not damaged will. To properly clean an optical surface, first all dust and grit or other abrasive material must be removed. This is done usually with some type of air blower or puffer and a specially designed very soft brush. If using a can of compressed air be sure to not allow the cold liquid to strike the surface of the lens. Never wipe any lens with a cloth or lens tissue without first removing any dust and grit from the lens with an air stream and fine brush. Wiping a lens before removing any dust and dirt that is like using sandpaper on the fine and fragile optical coating. Once the lens surface has been cleaned of any grit, is then permissible to use a soft cloth to remove smudges or fingerprints. Never use any cleaning liquids on the lens unless it is approved for use by the camera lens manufacturer. In general, good camera hygiene would be to wipe the entire camera down with a soft cloth removing any exterior dust and dirt after each days use. When charging batteries look at the contacts to ensure they are clean, not bent, and free of any dirt or grease. Occasionally it may be necessary to use a vacuum cleaner on the camera’s carrying case to remove dirt and dust which can accumulate over time in the case. Wipe dust off the battery charger, cables, and any components that go in the case with the camera. Periodic cleaning of your camera and optics can help to ensure proper operation and a long life. Infrared inspections of building envelopes is one of the many topics covered in the Infraspection Institute Level I Certified Infrared Thermographer® training course. For more information including course locations and dates, visit Infraspection Institute online or call us at 609-239-4788. Inspect ladders before each use. Remove broken ladders from service and repair or discard.· Use a ladder only on a stable, level surface. Do not stack ladders on boxes, barrels, or unstable platforms to gain additional height.